Thanks to the generous supporters of our 2018 Circle of Hope Champions for Children Luncheon, Hope Street’s Summer of Science reached new heights this year - inspiring future scientists, engineers, technicians, and health care professionals. 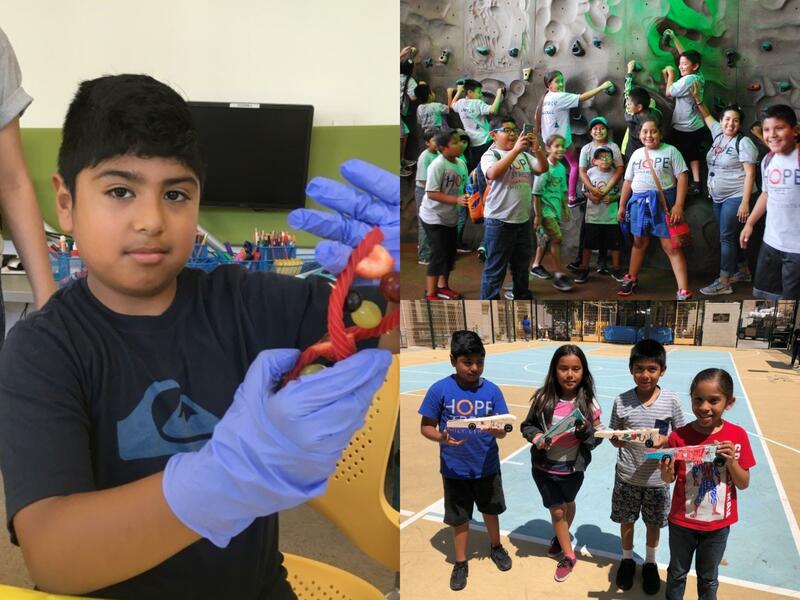 This summer 140 community youth were introduced to rocketry, robotics, chemistry, anatomy, biology, and earth sciences through hands-on project-based learning experiences and weekly field trips. As part of their community service commitment, students organized a food drive for St. Francis Center, a local organization serving people who are homeless, and made care packages for pediatric patients at California Hospital.Our Summer of Science program concluded on August 8th and the new school year is in full swing, but planning for summer 2019 is already underway! Jonathan Club’s Chef Jason led three “Snack and Learn” sessions this summer - teaching students about nutrition, healthy food recipes, and how to start a vegetable garden. According to the students, Chef Jason’s delicious gourmet snacks of homemade hummus, fresh grilled vegetables and mini lemon cakes and raspberry dessert tarts were the best! Chef Jason is so passionate about “hyper-local” food he established a 3,000 square foot rooftop garden at Jonathan Club in downtown Los Angeles. The garden produces up to $100,000 worth of produce each year including herbs, gem lettuces, Swiss chard, blueberries, baby carrots, yuzu, broccoli, snap peas, tomatoes, and more. At the last “Snack and Learn,” students planted cilantro and jalapeno peppers in small pots to take home to share with their families. On August 8th, Aetna volunteers helped our students get ready for school - bringing and distributing 100 backpacks filled with back to school supplies that were generously donated by local Aetna employees. On August 6th, volunteers from AEG spent the afternoon helping students with art projects and played a very high energy game of dodgeball on our outdoor sports court - in 100 degree heat! On August 7th Jonathan Club graciously hosted a magical day for over 75 Hope Street kids at the Beach Club in Santa Monica. Youth relaxed on the sand, played beach volleyball and beat the heat swimming in the ocean. Jonathan Club also provided a scrumptious lunch and each student returned home with a new beach towel. A special thanks to Jonathan Club for a perfect ending to a great summer at Hope Street! 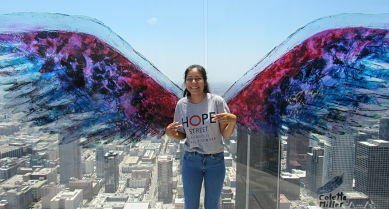 "We Need More Hope Streets"
When Hope Street student Raquel Ortiz, a sophomore at USC Cinematic Arts and Engineering Magnet School, was given an assignment by her journalism teacher to write about something that is having a positive impact on her community or the world, the first topic that came to her mind was Hope Street. Raquel said the article was one of the easiest pieces she’s ever had to write since Hope Street has been such an important part of her life and that of her family. Her article explained how the YELP program helps older kids obtain work experience while also gaining insights into the challenges younger students face. YELP is Hope Street’s Youth Education Leadership Program, and YELP students serve as mentors to younger children, while providing support to teachers in Hope Street’s Early Childhood Centers. YELP students are required to meet academic and job performance goals and attend Saturday workshops on life skills, college prep, financial literacy, and early childhood development. “Smaller kids have a lot to say which gives older kids insight about what they think and how they think,” Raquel explained in her article, adding that YELP students become important role models for the younger kids mentoring the younger children in the same way that YELP students have been mentored by Hope Street staff. The annual Champions for Children Luncheon will be held Friday, February 22, 2019 at the Jonathan Club, Downtown Los Angeles. 100% of proceeds support Hope Street’s after-school/summer programs. For more information and sponsorship opportunities, contact Rachel Zupa at (213) 742-6475 or rachel.zupa@dignityhealth.org.